We’re taking a poll. Do you agree or disagree with the assertion that it should be equally hard (and equally easy) to learn all (that is, any given) spoken languages in the world — if we are acquiring them in the right way. What do we mean by this? To me (Doug), acquiring a spoken language in the aural/oral way should be tackled by memorizing whole texts through mimicry. I believe this is the only way to capture the true melody of the language the way locals speak it. By listening to and then later producing whole sentences using recordings made by native speakers, shouldn’t a trained newcomer be able to learn to understand and speak any new language in the world in a matter of months or a few years max? Disclaimers: Note that I’m not talking at all about written language. To me, written language introduces an entirely different challenge that deals with the eye gate. With written language, one might have to learn a new script using completely foreign letters — and this might take longer even for insiders, depending on the particular script involved. But isn’t it true that babies the world over generally all learn to understand and speak their native language between 1 year and 3 years of age. (They might speak it in a very basic way at age 3, but they typically are at least starting to get the hang of it, right?) Note that this is true of Russian babies, or babies in North Africa, the Middle East, Africa, or Mexico. Language is no respecter of persons, when it comes to babies. So, in a similar way, doesn’t it stand to reason that if we’re dealing only with spoken language (the aural/oral gate), shouldn’t we all be able to do what babies do — only maybe better? To me, this is why maps like this one…. make no sense at all. Never mind that the data might be provided by some famous group with lots of travelers having spent lots of time overseas (the Foreign Services Institute). As ashes on the ground, I’m still bold enough to propose that they’re missing the boat. Maybe they’re confusing the matter with learning a written language alongside the spoken. Here’s the bottom line: If I want to say, “This is my third day in your country,” it seems to take me exactly the same time to learn the mumbo-jumbo in a city in Asia as it does to say the equivalent mumbo-jumbo in a village in South America. Because to me, it’s all equally hard — and it’s all equally easy. I’ve tried this in countries all around the world. I don’t consider myself a quick study on language. It’s ALL very difficult for me. But it’s also all very equally easy. With the aid of a helper, I facilitate the helper in constructing a series of nonsense syllables that, taken together, with the right flow — if I learn to repeat those same syllables in exactly the same way with exactly the same flow — people tell me their names. Or they tell me where the bathroom is. Or they ponder the meaning of the brief story I just shared. It’s all equally hard. And it’s all equally easy. Your thoughts? Please respond by clicking comment after the web or app version of this item. And thanks in advance for your response. Phrase learning is not language learning. And it’s a simple fact that some languages are cognate-enough to a given language speaker that it is fairly simple (ie, faster) to gain basic conversational/written levels. But others are indeed much more complex (Eg, English speaker learning Arabic) and mass experience shows that to gain fluency in that case typically takes X months/years. David, if you could skip past all the banter, when you have a moment, check out this discussion between linguistics experts at Michigan State University. Check out their flat-out statement/claim: “Nobody believes any more that some languages take longer to learn than others.” They basically completely dismiss that whole idea as “old news” that no one believes any more. Doug, you are correct to a point. I’ve learned significant bits and pieces of several languages, and I’m still trying. However, tonal components of languages have been extremely difficult for me. Even though I have a bit of a background in music, which should help, my ear just can’t seem to “hear” the variation in tones where needed. That can be a deal-breaker. We have had to learn both a Western language (Portuguese), and an undocumented African tonal language. Although Portuguese is like a modern Latin, with many conjugations, these were were way more simple to learn in comparison with the tribal undocumented language. The conjugations in that language were way more complex, and then there was the fact that the language is tonal. All babies may have the same difficulties to learn any language from nothing, but adults differ because they already have pre-learnt ideas that they have to unlearn for new languages, especially tonal languages. It took my wife and I about a year to become reasonably fluent in understanding Portuguese, but about 2-3 years for the tribal language with the same effort level. HUGE difference – for adults. Also, it’s worth mentioning that it is much more difficult to learn to UNDERSTAND a language than to speak it. Most sites, like the one you refer to, only measure speaking. For being effective in making disciples, you have to understand native speakers well, not just be able to “preach at them”. I refer to this as “ministry proficiency”. Search for Greg Thomson’s “Growing Participator” method for detail on this. I love Greg Thomson’s work. I guess it would go back to your definition of what it means to learn a language. Learning to mimic back a phrase correctly is very different than learning to create with the language correctly (repeating “where is the bathroom?” vs using what you know to ask endless possibilities of questions). How long it takes or how hard it is to learn to use a foreign language as a native speaker of that language would use it usually depends on how close that language is to the speaker’s native language (in pronunciation, grammar, sentence structure, etc.). Hence the various data sources on how long it takes to learn other languages for native English speakers. I’m sure we’ve all had experiences where we’ve heard others (and been that person ourselves!) say something “correctly” in a foreign language, but it’s not understood because it’s not the way a native speaker expresses that concept. The degree to which the new language is different from the native language in this way also adds time to navigate it better (and I would argue there is always room for growth in this arena of language competency). Also, this is all in regards to speaking. Understanding native speakers is a separate skill and often is more difficult for language learners, depending on their method of learning. Reading and writing are separate skills as well. Moving from concrete to abstract expressions also takes time for most learners. I’m sure there are some people out there who can master difficult languages quickly, but I would say that is not the norm for most. Mimicking (with our monolingual ear) might miss by a mile. We do not have tones in English, but Chinese has several. The difference in tone (that an average American ear might not even hear) can make the difference between saying “horse” or “mother-in-law” (not a mistake you wanna make!). Now, if you are a native speaker of a tonal language, let’s say in the same linguistic family as Chinese, you would “get” the idea and the hang of it sooner. Many things to comment on here, and I speak from personal experience learning Thai. 1) when I was in 12th grade, we had an assignment to COPY a picture of Shakespeare’s stage. Should be easy, right? All papers should have been exactly the same, right? No, and no. Because not everyone can even copy that picture correctly (and I’m no artist). But those (others) with a gift for drawing made their pictures look much better than those of us who had no gift for drawing. Imagine if the object being copied were more complicated. The copies would have been even less alike. Same is true of languages, like pictures, some are easier to copy than others. And some people will copy them better than others will because of their gifting. Some languages are easier to copy than others. But there is more…. 2) Tones. Thai is a tonal language. A new language speaker might THINK they are copying the sentence exactly, but they aren’t. And it isn’t just missing a tone, as if that is a minor thing, some people don’t even HEAR the tones, and others don’t know that changing the tone changes the whole meaning of the word. 3) SPEAKING a language isn’t the same as COPYING a language. I can learn to copy “where is the bathroom”. But, if there are case endings, verb endings, different kinds of words for different settings, knowing and learning all that is way different than just copying a language. I agree that, especially for those of us from a western educational background, where our learning and practising as adults happened/happens mostly through reading and writing, our focus should be on listening and speaking much more – especially in the initial phase of language learning. Thank you for the reminder and encouragement in this – it is sometimes too easy to hide behind the comfort of a textbook or a passive learning method! – Studies have shown that learning a second language is more difficult than learning a third or fourth. For a third language, the brain already understands the basic concept of separation of different languages and concepts. – As someone already noted above, the distance from one’s own language is a massive factor. Use of tones; conjugation; common or related vocabulary; formality; grammatical fundamentals; the list can go on. – Learning an unwritten language exclusively by listening and speaking makes sense, but for languages that rely a lot on written language for communication, one simply has to study the written aspects of the language in order to communicate well as an adult. I’m enjoying the comments here, thank you for this post. Hi Doug, as a supervisor of language learners, I think you’ve over simplified this. Many factors apply, such as how different the sound systems and other aspects of the language are to languages known by the learner, and the gifting of the learner. For example, for visual learners a similar written system does speed up the process. I found it easier to learn a tonal language than a multi-syllable language and a language with a lot of grammatical changes which are too complex to be quickly assimilated. All languages can be learned but the learner needs to quickly discern which aspects of the language are most crucial to communication. Hi Brenda. Written language — that’s a completely different animal. (See my sentence in the above item, “Disclaimers: Note that I’m not talking at all about written language.”) I’m talking about aural/oral only. And I still wonder — because how will we positively TEST for this? — could it be that a properly trained language acquirer could learn to speak, understand, and *think* in any given second language at exactly the same pace, regardless of cases, tones, conjugations, modes, or any other facet? Because babies do it. Why couldn’t adults do it? Not just your opinion — but a modern (last 5 years?) scientifically-accurate study — would such a study exist? In a couple places on the podcast they seem to say that time-taken-to-learn is NOT equivalent to difficulty. What? Then what is the measure? And twice on there they flat out say it is because teachers of “the harder” languages spend more time talking “about” language and less time teaching it (those languages just have “bad teachers”). That is a relative (and naive) statement with no empirical data. Sounds like they just want it to be true. A funny side note: two of the three podcast leaders are Spanish teachers. No doubt they want their second language to be considered “as hard as” say, Urdu, Thai, or Finnish (with 15 case endings!). But just saying it doesn’t make it so. The Defense Language Institute gives 36 weeks to learn French and 48 to learn Tagalog. The time difference can’t be because of the “difficult script” since they both use Latin script. I think the DLI has just learned over the years that for an average, monolingual, American English speaker it will take more weeks to learn Tagalog than French. Of course it is much longer for language with different scripts (Arabic, Chinese, etc) but that strays from your aural question. I am not sure there will be any way to answer your question since not many languages are taught the way you want them measured. Meaning, most institutes have some form of writing introduced. And for such a study you would need similar students in the study group (all with the same linguistic background and all in the same controlled non-written learning environments). Do you ever watch films in other languages (using the subtitles… or not)? It is so fun to try to listen to the German (Spanish, French, Dutch) and see how many cognates we share. We watched a Dutch film recently and occasionally heard something like “this is the man” which of course was said “dit is de man” with a Dutch accent—- but still a bit recognizable (and fun) to us. When I watch a film in Thai I do not understand a word or hear one cognate …. but a Lao speaker likely would. And he would not think it strange at all that there are tones to distinguish between meanings. Steve’s comments appear to be right one. Another point worth mentioning is that the podcast simply ignores the issue of phonology, i.e., the way one’s first language teaches us to hear or ignore distinctions between sounds. A Bali speaker once asked me what the English word is for “a large body of water.” I answered, “sea.” He repeated “she,” to which I replied “No, ‘sea. '” He countered, “That’s what I said, ‘she. '” “Not ‘she,’ ‘sea! '” He looked totally frustrated. “You are just saying the same word twice!” Now the Bali hear just as well as English speaker do, and they actually use both the “s” and “sh” sounds in their language, but they don’t even realize the difference in the sound they are making. For them “sh” is the way that they “accidentally” pronounce the “s” when it come before the vowel sound “ea” (as in “sea”). They have been subconsciously trained 1) never to make the “s” sound before “ea” and 2) not to notice the difference between the “sh” and “s” sounds. That kind of phonological patterning has to be unlearned. That is, as they learn English they have to reprogram their brain to recognize the “sh” sound, and they have to retrain their tongue’s “muscle memory” to make the “s” sound before the “ee” vowel sound. So they cannot just listen to and pick up on English like they could if they were learning a language that had the same phonological patterns as Bali has. Thus, it is harder and it does take more work for them to learn some languages as a second language than it does others. Another one from phonology would be the “in” in English. We use “in” to mean “not” in English (such as in indiscreet, indispensable). Most native speakers do not even realize that we use “ing” if before certain sounds (“ing- correct”) and even change the written form before others (“im-possible”). If a person learns “impossible” first he might easily transfer that to “im-correct” or “im-dispensible” and be close, but wrong. ((side note: he might say “un-correct” if he learns “unbelievable” first)). These are all just crazy things our mouths say naturally. But if these “natural” things our brain and mouth do are really far from what a brain and mouth do in another language…. then it might take longer and “be harder.” Ain’t no shame in that. We have discussed case endings and tone, but we have not even discussed using implosive sounds, clicks, or strident vowels that many languages use. Clicks WITH tone anyone? Some languages use up to 140 sounds (English is in the 40’s) and I am afraid that many of us would not even “hear” the sound they are making, such as in the example you gave. Not to mention if our mouth muscles have never been used to make certain sounds they might be difficult to make at first (or at all!). Can those languages be learned? Of course. Might those languages take longer for a monolingual English speaker to learn than other languages? Yes. If they take longer, is that one way of measuring if they are “harder” for the average English speaker? “Dit is die man” (“this is the man”) in one language, and “Lo ngumntu” (with possible clicks, implosives, and tones) in the other? Funny, for years Wycliffe / SIL would ask would-be translators who were music majors in college (or musicians) if they would be willing to go to tonal languages. They put it kindly to the rest of us, but we knuckleheads got the point: we might not ‘hear’ the tones…. thus making it “harder” for us to learn than say a non-tonal language. Learning our “mother” language? Yes, all about the same time. However, once you have tuned your ears to that language, learning to speak another language varies by the close or distant relationship to that mother language. Thus, for an English speaker, it IS easier to learn another of the Romance languages. Our “ears” have not had to be sensitive to the tonal languages…though when my Dad raised his voice to me, I understood something different than when he did not! When we were doing pre-field training, Dr Brewster came to introduce the LAMB method. Made sense to me! Though I stand as suffering the awful disease of mono-lingual myopia! From personal experience, I would have to agree that Turkish grammer is much more orderly than English. It is, however, brain-frying-ly different from English. On the other hand, I’m told that Koreans have little trouble with Turkish grammer. My opinion is that it how difficult it is to learn a language depends upon how different that language is from one’s own. 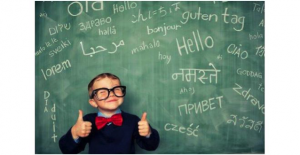 But that the study reported above does show that there is a difference in how easy it is for children to learn a language, starting from scratch. Thanks for that input MIke! As a linguist, my response would be that yes, objectively all languages are likely equally difficult to learn – as a child. When we are talking about second language acquisition, however, the difficulty of learning a language is relative to which language you start with. E.g. to go from English to Spanish might be a level 2 in difficulty while going from English to Arabic might be a 5. You have asked for proof: please visit https://www.state.gov/m/fsi/sls/c78549.htm to see how the US State department has ranked languages based on their experience of how long it has taken to train diplomats in various languages. The difficulty in learning another language as an adult is – at least in part – the need to unlearn grammatical and phonological patterns of one’s mother tongue in order to learn the new language correctly. The amount of unlearning to do should not be underestimated, and there are other factors that need to be taken into account: age of the speaker, his or her exposure to and knowledge of other languages, how different the language to be learned is in its structure, and there are more factors. I grew up in a moderately multi-lingual environment in Belgium, so I think my language learning ability would have been different if I had grown up in a solidly mono-lingual environment. I would caution against making sweeping statements about comparing language learning abilities as there are so many variables involved. All I know is : it’s hard work but it can also be fun. The difference lies in your attitude. IMHO, not all languages are the same. Some have more words, more preciseness, more sounds, etc. compared to others. If learning a language that is not your first, then there is a tendency to relate it to the one(s) you are already used to. This makes it easier as you can bring across concepts that you have already learned. And harder, as you make sounds and try to remember words that are different from what you are used to. So basically, I disagree with the notion.